For the poster design I was thinking of colour and spring and sunlight through stain glass. There was a poster I had seen recently from a San Fransisco design exhibition that overlapped colour and this idea of colours overlapping seemed to lend itself to the way sound overlaps and makes new sounds. With the towers of colour I wanted to convey the way sound travels like shafts of light while showing the rise and fall of sound through changes in colour and how differences in height. I also wanted to incorporate the look of the tribal tattoo designs that they had drawn on their faces – they remind me of musical signatures and clefs – except more abstract and interpreted – like their music. “Corazón sings from the heart and has in turn won the hearts of many Canadian audiences in the nine years since it began. This talented and motivated group of young singers from the town of Nelson B.C. 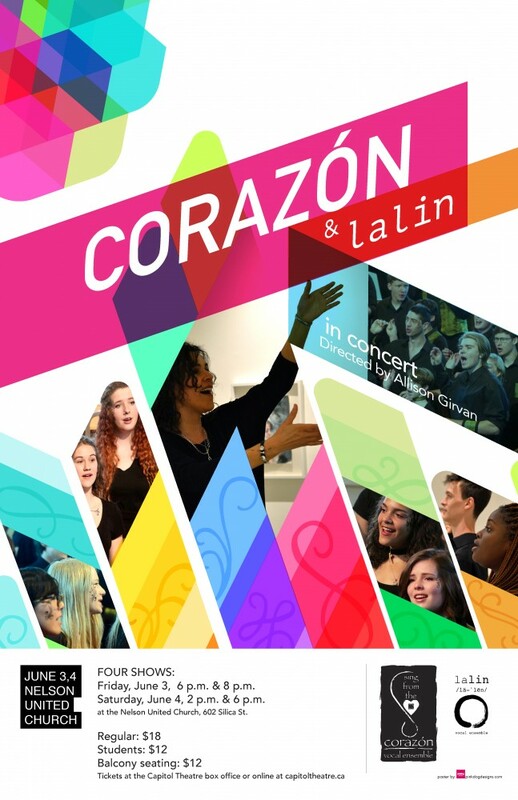 has gained a reputation for their blend, intonation and their world music repertoire.” Directed by Allison Girvan, Corazón will be singing this weekend. I hope you enjoy the poster. See you at the concert!